Star Analyzer is a diffraction grating filter created by Paton Hawksley to let amateur astronomers analyze the spectrum of several objects, such as stars, planets and planetary nebulae. It can be used to photograph the spectrum using many cameras like cooled CCD camera, planetary camera or DSLR camera. The Sar Analyzer is a filter provided with a 100 lines per millimeter grating, able to filter and deflect the light, creating an emission line called spectrum, with different color and wavelength. The spectrum is able to provide all the information of the temperature and composition of any celestial object. Each celestial object is composed of multiple types of gases and solids, these can be analyzed and separated by material, andthe the spectrum can be examined. 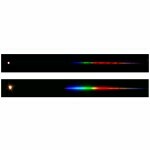 The Star Analyzer filter consists of a grating to 100 lines per millimeter is possible to observe or photograph with extreme precision and sharpness, three different types of spectrums.